For a picture of a sloppy operation which ended tragically, look no further than the takeoff crash of a firefighting helicopter in California in 2008. The case involves the intentional falsification of weight documents, the use of unapproved performance calculations, the flight crew’s failure to address issues relating to operating the helicopter at its maximum weight, and a host of other factors of neglect and complacency. Seven firefighters and two crewmembers were killed, and the remaining three firefighters and the copilot were seriously injured. In a fiery blaze across the 6,000-foot high ridgeline, the helicopter was destroyed. Since 2007, there have been 12 accidents involving flights operated for the Forest Service. If operators for the Forest Service were a passenger airline, they would be grounded for extensive corrective action. A particularly deadly crash, a Sikorsky S-61N near Weaverville, CA, raises safety issues which have arisen in other accidents. Neither the U.S. Forest Service (USFS) nor the Federal Aviation Administration (FAA) seem capable of self-correcting. This accident, involving a contract flight operated by Carson Helicopters, was the sad and unnecessary result. She was referring to “public use” aircraft, which are private aircraft operated on a contract basis for federal and local governments. These aircraft and companies are not subject to FAA oversight, and agencies like the Forest Service do not have the expertise to perform this function. “Public use” operations fall into a regulatory black hole. This Carson Helicopters fiasco is just the latest example. 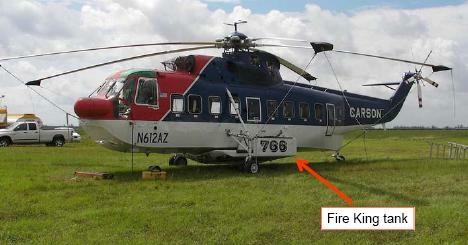 Four years later, the Sikorsky S-61N crashed. Nil supervision of Carson Helicopters preceded the accident that Hall lamented in 2004 was a “black hole” in FAA and Forest Service oversight. Details of the case are scandalous. The accident occurred on the third takeoff from landing site H-44, located in mountainous terrain near Weaverville. 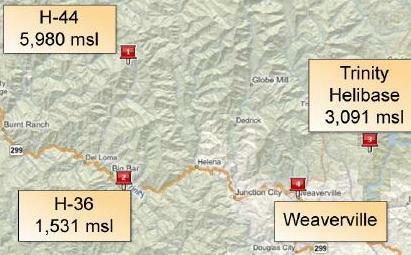 The 10 firefighters aboard were being shuttled to another location, lower than the 6,000 foot altitude of H-44. That morning the pilot-in-command (PIC) had calculated the helicopter could hover out of ground effect (HOGE) at the density altitudes expected for the day’s flights. 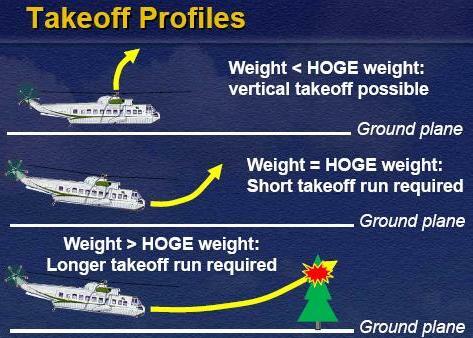 The USFS requires HOGE capability, because without it, takeoff is only possible if a sufficient clear area exists for the helicopter to move forward while in ground effect until translational lift is achieved. The PIC used weight documents and performance charts which had been deliberately altered by Carson Helicopters to give the appearance of higher payload capabilities. The PIC was led to believe that with 10 firefighters aboard he still had sufficient power and lift for HOGE. The fact that the helicopter had approached its maximum performance on two prior departures was an indication that a dangerous overweight/underpowered situation existed. Since the flight crew was accustomed to operating at the helicopter’s maximum performance capability, no questions about performance were raised at the third takeoff with 10 passengers aboard, despite the fact that rotor speed (NR) decreased (drooped) during the previous two takeoffs. A USFS inspector pilot was aboard, but he failed to comment on the helicopter’s marginal performance. The accident takeoff was unsuccessful because the helicopter was loaded with more weight than it could carry in HOGE. In fact, the helicopter with pilots and fuel, at the altitude and temperature of H-44, could not carry any payload and satisfy HOGE requirements. The PIC was unable to maintain clearance from trees and terrain while attempting to gain enough forward airspeed to lift out of the landing zone. Even at maximum engine power, the helicopter was sluggish, and the rotors drooped. The aerodynamic situation during takeoff may be likened to an automobile going uphill. The accelerator is pressed all the way to the floor, fuel flow is at a maximum, yet the car slows on the uphill road. For helicopters, the technical term is “topping.” The condition had been achieved on the day’s previous two takeoffs; on the third and fatal takeoff the struggling helicopter hit a tree(firefighters aboard the earlier takeoffs noted that the helicopter remained below the treetops for an extended period of time). In the moments before the crash, the pilots remarked about the rotor blades drooping despite 100% power. The copilot was urging the helicopter to gain altitude. “Fly darling,” he murmured repeatedly. The fiery crash killed the PIC and the USFS inspector pilot, as well as seven of the 10 firefighters aboard. There were major shortcomings in USFS oversight before the crash. 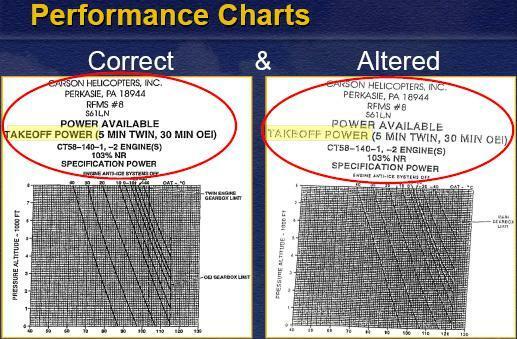 When reviewing Carson Helicopters’ bid package, the contracting officer did not detect that the takeoff power available chart had been altered to indicate that 2.5-minute emergency power was available for normal (5-minute) operations. This chart should have received specific scrutiny since the USFS was aware that Carson Helicopters was opposed to the USFS 2006 decision to not allow the use of emergency power for contract bidding and actual load calculations. As the NTSB pointed out, the USFS may have assumed that the FAA would assure the helicopter’s airworthiness. However, under the “public use” proviso, the FAA does not exercise any oversight. In the 12 months before the accident, the FAA examined zero public use activities at Carson Helicopters. With the FAA taking a hands-off approach, the USFS must rely on its own oversight which, in this case, was grievously lacking. 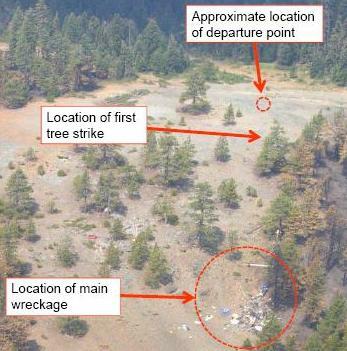 The NTSB was also very critical of USFS inspector pilot. He did not notice that the helicopter was overweight. He didn’t notice or comment on the helicopter’s marginal performance during the previous two takeoffs. According to the cockpit voice recorder (CVR), he never questioned the PIC about the helicopter’s overweight condition or its underpowered performance. Although the inspector pilot had 11,000 hours in turbine helicopters, he did not have an S-61 type rating and had never flown as a P-61 PIC. The USFS did not require PIC time or type rating for inspector pilots in each type of helicopter in which they perform evaluations (this has been changed post-accident). Moreover, the inspector pilots did not review overall pilot proficiency, as typically done by the FAA. Rather, USFS inspectors evaluated USFS-specific missions, such as water/retardant delivery. On the day of the accident, the inspector pilot was checking the PIC’s ability to transport passengers in a fire environment. The passenger seats in this helicopter were a major hazard during a crash. 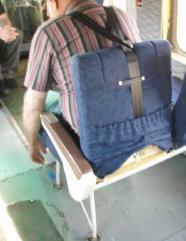 The seats had been retrofitted with a shoulder harness to complement the lap belt. Ordinarily, this addition would provide greater protection to the seat occupant. However, because the seatbacks folded forward, the manner in which the shoulder harness was attached provided no improved protection. The shoulder harness installation actually increased the risk of injury to the occupant. Carson Helicopters had installed the shoulder harnesses on seats with non-locking folding seatbacks. The USFS, lacking detailed aviation expertise, approved the installation. The NTSB issued 10 safety recommendations to the USFS, all of which dealt with details, such as “require a hover-out-of-ground-effect power check to be performed before every takeoff carrying passengers …” The NTSB failed in the most important matter: “public use” helicopters, airplanes and operators remain a regulatory black hole. These operations are supposedly supervised by the agency providing the contract — in this case the Forest Service. The Forest Service cannot be expected to backfill this fundamental requirement of the FAA. For its part, the FAA stated it was providing “technical information” to the Forest Service to develop an effective maintenance and inspection program. The FAA has not assumed oversight for “public use” operations, as it has for all Part 91, Part 135 and Part 121 aircraft and certificate holders. NTSB Chairman Hersman opined that something akin to joint custody is needed, specifying where USFS and FAA oversight begins and ends. From this accident, however, there is no such recommendation. There is a recommendation, # A-10-159, to “create an oversight program to reliably monitor” contractors. This language may be too general to have the effect desired by Hersman. Six months after the crash, the Forest Service terminated the arrangement with Carson Helicopters, stating in its 18 February 2009 notice that the action was being taken due to “Carson’s failure to comply with the contract term and conditions.” Contract termination – absent prosecution – seems a mighty light penalty for deliberate falsification of records resulting in deaths, injuries, and shattered families.